This is a request from a co-worker for his son. 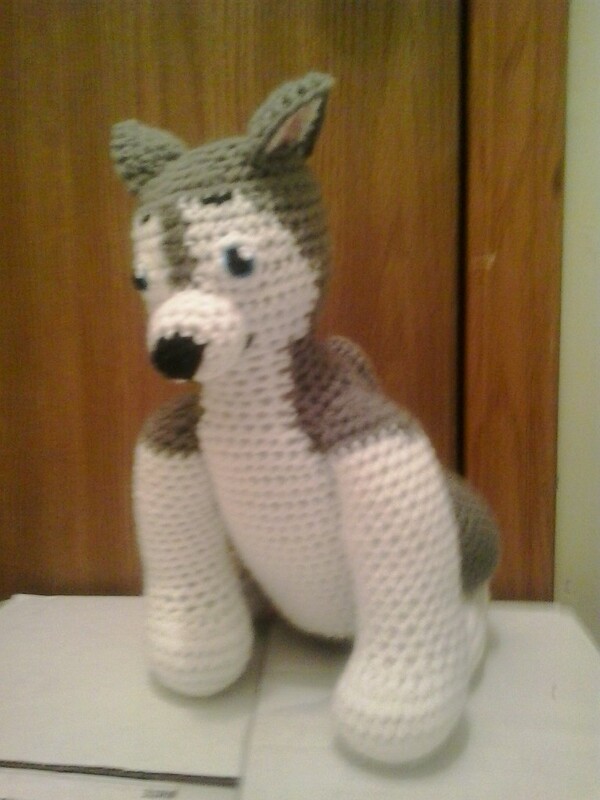 His son is crazy about huskie dogs. This pattern will also help set the stage for when I make Paw Patrol Everest for another co-worker of mine. Worsted weight yarn: grey heather, white, baby pink, black, and delft blue. Embroider EYES, EYEBROWS, and MOUTH on HUSKIE. Rds 10-25: sc in each sc around. (18) Change to grey heather after Rd 25. BEGIN STUFFING FRONT LEGS FIRMLY. CONTINUE STUFFING FRONT LEGS FIRMLY AS YOU GO ALONG. Finish off leaving a long tail. Adding necessary stuffing to get shape. Sew FRONT LEGS to BODY. Rd 8: Holding right side together and working through both thicknesses, sc in next 9 sc, turn LEG inside out, 2 sc in each remaining sc of Rd 7, slip st in first sc after turning inside out. (18) Change to grey heather. BEGIN STUFFING HIND LEGS AT THIS POINT. STUFF LOWER PART OF LEG FIRMLY AND UPPER PART LIGHTLY SO THAT IT CAN BE FGREY HEATHERNED. BEGIN STUFF TAIL FIRMLY. CONTINUE STUFFING TAIL FIRMLY AS YOU GO ALONG. Finish off leaving a long tail. Sew TAIL to BODY. Rw 6: Ch 1, turn; sc in next 5 sc, 3 sc in next sc, sc in next 5 sc. Everest and Paw Patrol are copyright Nickelodeon and their respective creators. This crochet pattern is an original pattern and is © by Christjan Bee (March 2018). Please do not claim this pattern as your own. If you wish to share this pattern, you may link to this pattern but please do not reprint/repost it on your site. You may print and keep a copy for your own personal use; but you may not sell or distribute it, or sell items made from this pattern.